Many people do not visit the dentist for regular check-ups because they are too scared or have dental anxiety. Sedation dentistry offers a way to provide a safe, anxiety-free, dental experience to those who are afraid of visiting the dentist. Sedation dentistry is often mistakenly thought to induce sleep. In fact, most sedatives allow for the patient to be awake during the procedure. Sleepiness is a side effect of some medications, but nitrous oxide, oral conscious sedation and IV sedation only work to calm anxiety throughout the dental visit. 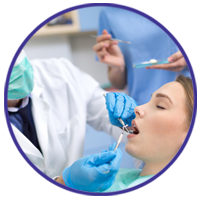 Sedation dentistry is popular because most sedatives can be taken orally, meaning no injections, anxiety or pain. Some sedatives work so well that even the smells and details of the procedure cannot be recognized afterwards. The most widely used dental sedatives are nitrous oxide, oral conscious sedation, and IV sedation. Different levels of sedation (mild, moderate and deep) can be utilized depending on the patient’s needs. Before using any sedative, the dentist must analyse the medical history of the patient, as well as taking note of any current medications.